Siding painting is an important part of caring for any home. A fresh coat of exterior paint can help improve your home’s appearance and protect siding from weather changes, fading, and moisture. If you begin to notice signs of wear or damage, you may wonder if painting your house siding will help. It’s important to know that most siding types can benefit from new paint, but only if painted properly. So, can you paint your house siding? Let’s find out. Many homeowners think that they should replace aluminum siding once the color fades from the sun. But, aluminum siding can be successfully painted when done by professionals. The best house painters will give your aluminum siding a good power wash and repair any damage before repainting. They will then use an airless sprayer to apply two coats of acrylic latex paint. These tools and techniques allow for a flawless aluminum painting job that lasts. When to repaint aluminum siding: When painted by experienced professional painters, aluminum siding can go 10 to 15 years before requiring new paint. Can You Paint Cedar Wood Siding? Cedar wood siding is a popular, beautiful choice for protecting the exterior of your home. When it fades, exterior painters will typically apply a fresh coat of cedar stain to bring it back to life. Before applying new stain, professional painters will prep your siding by cleaning off loose or old stain. They will then apply latex caulk in the gaps and joints to prevent future cracks or bowing. In addition to staining, you can also paint cedar wood any color when high-quality latex paint is used. When to repaint cedar siding: When properly stained or painted by professionals, cedar stain and paint can last 8 to 10 years. If you have hardie board or HardiePlank siding, you’re in luck. This very durable, heavy siding can be painted any color and effectively protect the outside of your home for decades. HardiePlank siding paint can fade over time, but won’t ever chip, peel, or fail when painted correctly. When to repaint HardiePlank: When professional painters apply two coats of high-quality paint to HardiePlank siding, it can last for 20 years! Can You Paint Stucco Siding? Stucco siding is ideal for protecting masonry surfaces from rain, snow, and wind. When you call on professional painters for stucco painting services, they can paint this type of siding any color to give your home a fresh, new look. When adequately painted, stucco siding can go decades without showing signs of peeling or blistering. When to repaint stucco: When professional painters paint your home’s stucco siding, it can last 20 years or more before requiring new paint. Are you ready to repaint your siding? Trusting your home to the right professional exterior painters will ensure that the proper techniques, tools, and paints are used for your project. A new coat of siding paint is the last line of defense to protect the exterior of your home, so make sure you choose the best painters in the business. Contact us today for a free house painting quote! 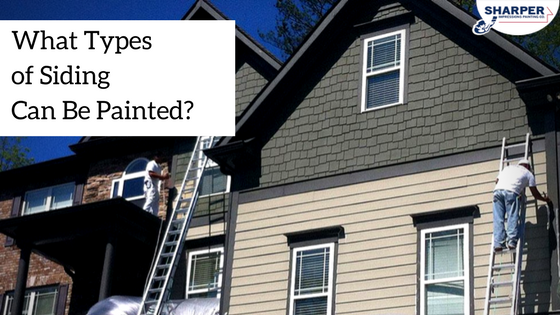 Home » Recent Projects » Painting Siding on a House: What Types of Siding Can Be Painted?